Lucas Oil has been a Corporate Sponsor of the SSRT since August of 2004! Our first order was a whole 24.9 gallons of fuel for the Galion Grader. Three years later the SSRTA purchased( with the help of a DCNR grant) the Kobota Tractor and a free standing fuel tank-which helped make filling up a lot easier than climbing up on the Galion! And now we have added the Bobcat Skidsteer to our inventory-so it is Herb and Donna that helps keep us running! 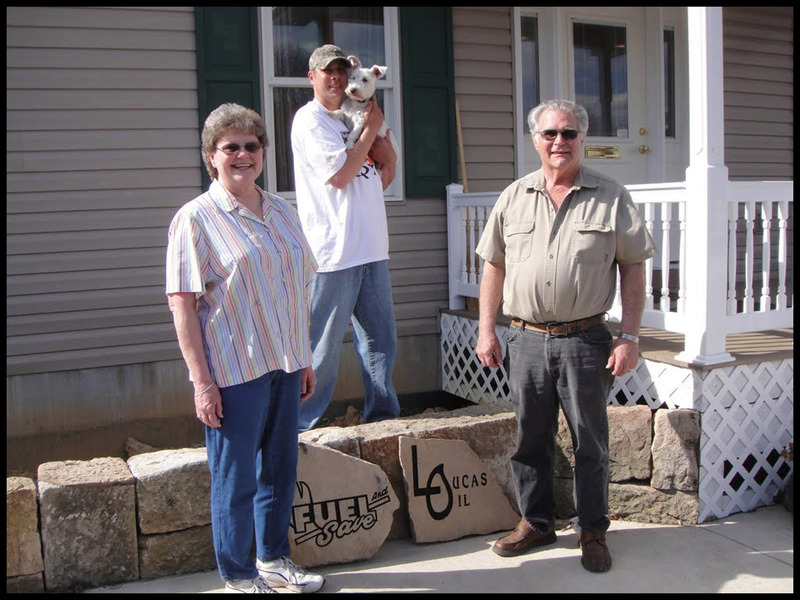 Herb and Donna Lucas have been married for 25 years--and began their Fuel business in October of 1993. Up until then, Herb had been an Inspections Manager at Imp's, and Donna worked at the Karthaus Bank. In '74 Donna, started to work only part time so that she could go to school and landed a job with the Agricultural Department in Clearfield. Meanwhile, Herb after being laid off for several winters , started to think about the Fuel Business even though he was the stay at home cook--and by 1993 he had convinced Donna that Lucas Oil was their future. They bought the "Fuel and Save" out of Bigler in 1995-the same year that their son Troy started working for them, after returning home from the military- leaving patriot missiles, army, Saudia Arabia and Korea behind. Soon Marilyn Fanning joined their " fuel family" in 2006 as their secretary. And we can't forget the most lovable character-Troy's terrier Hines ( named after Pittsburgh's Steelers great-Hines Ward). In October 2010 the original office suffered a fire-on Donna's 60th Birthday!-and the Lucas' had to work out of their bedroom until the now newly constructed office of present was completed. Considering that Lucas Oil covers an area from Clarence to Grampian--that had to be a lot of STUFF to work around until the office was done! The SSRTA is proud to have Lucas Oil as a sponsor and friend of the Trail-we only wish that these hard working people could take more time off to enjoy the Trail on their ATV's. We think Hines wants to RIDE! !